Who is the Best Pitcher to Ever Pitch for the Toronto Blue Jays? 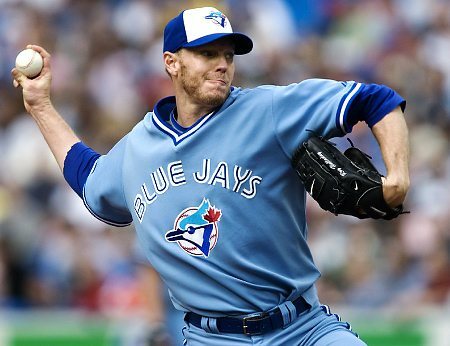 Okay, now that Roy Halladay has retired as a Blue Jay, let’s put the question out there. Who is the best pitcher to ever pitch for the Blue Jays? Notice the way I’m phrasing the question. I’m not asking who was the best Blue Jays pitcher, but who’s the best pitcher to suit up for the Blue Jays. It could have been for one game or many but let’s open the discussion. First there’s Roy Halladay who will probably be a test case for non-accumulation pitchers in the Hall of Fame. What do I mean by “non-accumulation?” I mean that pitchers who haven’t had extremely long careers that have enabled them to accumulate counting stats that have traditionally been the benchmarks for Hall of Fame inclusion. For Hall of Fame inclusion, normally 300 wins was the benchmark but in today’s baseball game, it’s unlikely anyone will amass that number with two players eligible for the Hall this year becoming two of the last: Greg Maddux and Roger Clemens (we’ll get to him a bit later). Roy Halladay retires with 203 wins, almost 100 short of the benchmark although that might be getting lower and lower these days: Bert Blyleven, the most recent pitcher inducted to the Hall, won 287 games in a 22-year career. One of the few Hall of Fame pitchers to have less than that is Sandy Koufax who won 165 over his 12-year career. Both pitchers (Halladay and Koufax) were dominant in the game at their peaks and thus Halladay will probably merit serious consideration. Let’s start our conversation with the only pitcher in the Hall of Fame to put on a Blue Jays uniform, Phil Niekro. The knuckleballer had an amazing career, leading the league in innings four times (in all three, Niekro pitched over 300 innings), winning 318 games but losing 274 for a .537 winning percentage over his 24-year career. He threw 5404 innings with 3342 strikeouts (leading the league once in 1977 with 262 Ks). Baseball Reference has him valued at 97.4 rWAR (80.8 fWAR) over his career despite a -0.3 rWAR with the Blue Jays (pitching only 12 innings). As we can see, Niekro’s incredibly long career enabled him to amass the magical counting stats that Hall of Fame voters love to see: 300 wins and 3000 strikeouts. That said, his career 3.35 ERA is quite good and even when you consider the era he pitched in, Niekro had a career ERA- of 86 (14% better than league average) and career FIP- of 95 (5% better than league average). Niekro’s peak was pretty incredible. From 1974 to 1979, Niekro was never worth less than 6.6 rWAR and peaked with a 10.0 rWAR in 1978, throwing 334 1/3 innings. Fangraphs rates that period a little less with fWARs of 6.7, 3.7, 4.4, 6.0, 9.0 (1978) and 3.8. If we want to use the more conservative Fangraphs ratings, we also see that Niekro had three other seasons of fWARs between 6.6 and 6.9 along the way while Baseball Reference gives Niekro only one other season at 6.0 rWAR (1969). So there’s the case for Niekro. I urge you to head over to both BR and Fangraphs to check out his career for yourself. Next on the docket is Jack Morris whose 15-year voting window for the Hall of Fame closes this year. Morris has been on the bill for 14 years making this year his final chance to get in. With a very crowded list of players eligible this year, it’s unlikely that Morris earns his entry to baseball’s shrine. Morris pitched for two of his 18 big league seasons in Toronto, helping the Jays to their two World Series victories in 1992 and 1993. Morris has four World Series rings and was the 1991 WS MVP with his hometown Minnesota Twins. Morris was a 5-time All-Star and accumulated a 254-186 record (.577 winning percentage) over 3824 innings with a 3.90 ERA and 2478 strikeouts. Morris didn’t quite have the kind of peak that Niekro did but did have three consecutive very good seasons between 1985 and 1987 with rWARs of 4.9, 5.1 and 5.1 (Fangraphs has those years’ fWAR at 4.4, 3.5 and 3.6 with a 3.7 in 1988). Surprisingly, Morris only accumulated 43.8 rWAR and 52.5 fWAR over his career. We’re going to throw Dave Stieb into the conversation here, mainly because he’s a good comparison for both Halladay (in terms of years pitched) and Morris (both pitched in the same era). Stieb played in parts of 16 seasons but four of those were in very reduced roles or spent in part on the disabled list. Despite pitching only 2895 innings over his career (almost 1000 fewer than Morris), Dave Stieb managed to rack up 57.0 rWAR and 46.4 fWAR going 176-137 (.562 winning percentage, only 15 points lower than Morris but on many worse teams) and posting a career 3.44 ERA. According to Baseball Reference, Stieb’s peak was outstanding, posting the best rWAR for pitchers in the AL for three consecutive years (1982, 1983, 1984) with a third place finish in 1981 and a second place finish in 1985. He was bad in 1986 but rebounded with four more above-average seasons before injuries limited his ability to pitch a full season starting in 1991. Basically, what my research has revealed was that Stieb was one of baseball’s most dominant pitchers of the 1980s much in the same way that Halladay was for the 2000s. This brings us to probably the most controversial figure on this list. Roger Clemens spent two Cy-Young-winning years with the Blue Jays as the one of the most dominant pitchers in the league before wanting out and getting traded to the Yankees. I don’t want to comment on Clemens’s toxic personality or the allegations that he used steroids and lied about it to Congress (charges of which he was acquitted) but the fact remains that Clemens was the winner of seven Cy Young awards and, if we look at his performance on the field, was one of the greatest pitchers of all time. In a career that spanned 24 seasons, Clemens threw 4916 2/3 innings with a record of 354-184 (.658 winning percentage) with a 3.12 ERA and 4672 strikeouts. Clemens is third all time in strikeouts, 18th all time in winning percentage (Roy Halladay is 17th), and third in Pitcher’s rWAR. Baseball Reference has Clemens as having a 139.4 rWAR and 20.1 of that came from his two seasons with the Blue Jays. Interestingly, Fangraphs has Clemens’s value as being almost exactly the same, 139.5 fWAR with 19.3 of those wins coming as a Blue Jay. I’m not going to pass any value judgements on Mr. Clemens here but I’ll let you do so in the comments. Compared to some of these greats, Halladay was very good. In a 16-year career (with a few partial seasons here and there), Halladay racked up a 203-105 record (.659 winning percentage) in 2749 1/3 innings with a 3.38 ERA and 2117 strikeouts. While these numbers fall way short of the Hall of Fame benchmarks in counting stats, Halladay’s durability and his dominance at his peak (and the length of that peak) are outstanding. Halladay’s career rWAR of 65.6 and fWAR of 67.6 exceeds both Stieb and Morris. What’s unusual about Halladay is that his peak is so long and so high, according to both measures of value. Both agree that Halladay’s first big season is 2002, accruing over 7 WAR in both Baseball Reference’s measure and Fangraphs’s measure. He followed that up with a 2003 that was worth 8.1 rWAR or 7.4 fWAR. 2004 is an outlier but more because of some shoulder problems that limited his effectiveness and his innings (only 133). The following season was better, netting 5.5 rWAR (or 4.0 fWAR) despite also being injured by a Kevin Mench line drive that broke his leg on July 8 in Texas. In 2006, Halladay came back strong, with a 5.2 rWAR and 5.4 fWAR. 2007 was a bit weaker by Baseball Reference standards (3.5 rWAR) but very good by Fangraphs’ (5.3). After that, however, Halladay reeled off four outstanding seasons (two for Toronto and two for Philadelphia) that all were worth at least six wins above replacement by either standard. What we’re looking at with Halladay is a career peak (somewhat limited by injuries) that spanned ten seasons from 2002 to 2010, making him perhaps the most dominant pitcher in baseball in that span. He posted totals of over 200 innings pitched eight times in that span making him incredibly durable as well. So, Blue Jays fans: Who is the best pitcher to ever pitch for the Toronto Blue Jays? We’ll limit ourselves to these five and choose away! This is silly. When are you going to do the best player to ever suit up for the Brewers? when I write a blog about the brewers! It’s not like there’s really any debate here. Clemens is arguably the greatest pitcher ever, despite outstanding douchebaggery. That discussion allows us to talk about other major Jays contributors, too, like Jimmy Key and Tom Henke!